As the world reckons with the results of the US presidential election, and while Brexit negotiations remain hanging in the air, there are speculations of realignments in political and trade relations involving the US and Europe, prompting investors to sharpen their focus on markets in the Asia-Pacific region. 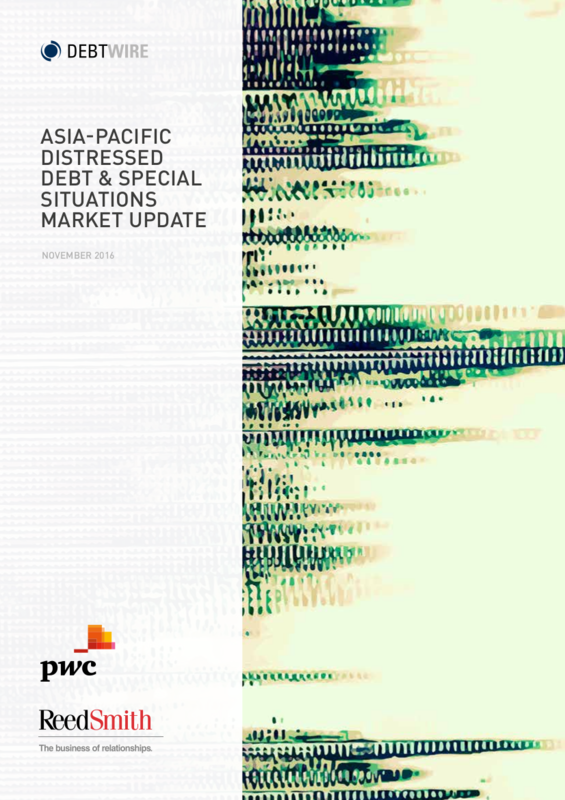 Debtwire’s Asia-Pacific Distressed Debt & Special Situations Market Update, produced in association with PwC and ReedSmith, shows that in the next 12 months, 88% and 100% of respondents are planning to allocate more or the same amount of capital to Asia-Pacific distressed debt and special situation opportunities respectively. Respondents include a mix of private equity investors, prop desk traders, hedge fund managers, credit risk or workout managers, and emerging market investors. China offers the most attractive distressed opportunities in Asia-Pacific in the next 12 months, according to 52% of those surveyed, followed by Japan (35%) and India (7%). Financial services, oil and gas, and energy are some of the largest topics in distressed debt at the moment, and respondents are also bullish about their prospects in the sectors. 60% of respondents chose financial services as one of three sectors they look to target in the next 12 months. The issue of unfavourable bankruptcy laws is ranked as the greatest impediment to restructuring efforts, nominated by 35% of respondents, followed by the lender’s own capital issues (33%) and debtor delay due to legal and regulatory permissions. In the next 12 months, 90% and 82% of respondents are expecting to see an increase in volume in primary markets for high yield bonds and private placements (loans and bonds excluding bi-laterals) respectively. “Volatility and uncertainty remain the watchwords of the year to come, both in economic and geopolitical terms, and it is up to the shrewd investor to know when to strike while the iron is hot,” says Luc Mongeon, Managing Editor of Debtwire Asia-Pacific, in the foreword of the report. The report provides an in-depth review of emerging trends in the distressed debt markets as well as insight into expectations for Asia-Pacific distressed debt and special situations in the next 12 months.